Exhibition "Women of Mathematics throughout Europe. 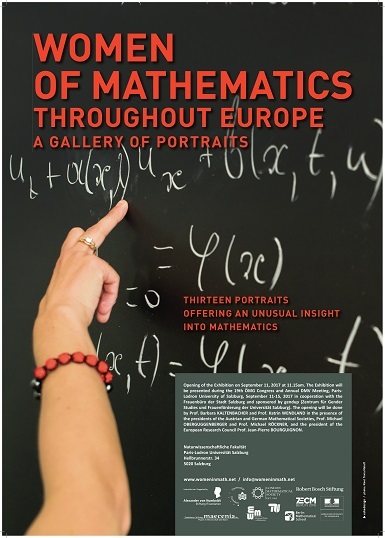 A gallery of portraits"
The exhibition "Women of Mathematics throughout Europe. A gallery of portraits" will be presented during the congress in cooperation with the Frauenbüro der Stadt Salzburg. Immediately after the exhibition opening there will be the Emmy Noether Lecture of the DMV, which will be given by Prof. Ursula Hamenstädt and has the title Dynamics on the moduli space of abelian differentials. A report on the exhibition written by Maria Infusino is available as PDF. We are grateful to acknowledge the support by gendup (Zentrum für Gender Studies und Frauenförderung der Universität Salzburg).